No7 is a new brand that i have started getting into. I have a hard time finding the right day and night moisturiser. For the past month and a half I have tried Clarins, Estee Lauder, Elizabeth Arden and now I thought i'd try No7 skincare. I'm 23 and i'm at that age where I want to start looking after my skin and properly with a Day and Night Cream and so much more. Having to admit my favourite creams are likes of Daywear from Estee Lauder - but the fact there isn't a proper night cream does annoy me even if Daywear can be used at night time. You've then got my another favourite Clarins HydraQuench for the morning and their Multi-Active Night Samples I have been testing out which I have to say by far are my favourite creams. When you work in the beauty industry, you cannot help but notice what is popular and what isn't and it all depends on the price range. I have heard mixed reviews on No7 and wanted to test them out for myself. So here are some new purchases from the Boots Brand No7 that I've decided to trial out - They recently had some £5 off vouchers and decided to trial and test these out. I've decided to test and trial these out for 3 weeks and see how my skin feels by the end of the 3 week period to then be able to write an honest review of my experience with their range. I opted for their Basic range - Essential Moisture Day Cream £9 and Essential Moisture Night Cream £9.95 and their Beautiful Skin Quick Thinking Wipes £7 (I don't use these to take my makeup off but are very useful to have on hand). All I can say is the textures of both day and night are on the thick side - I don't have dry skin but I am not a fan of lotions or thin moisturisers as I do not feel they do anything to my skin. So If you are a fan of thick moisturisers, why not give these a go! 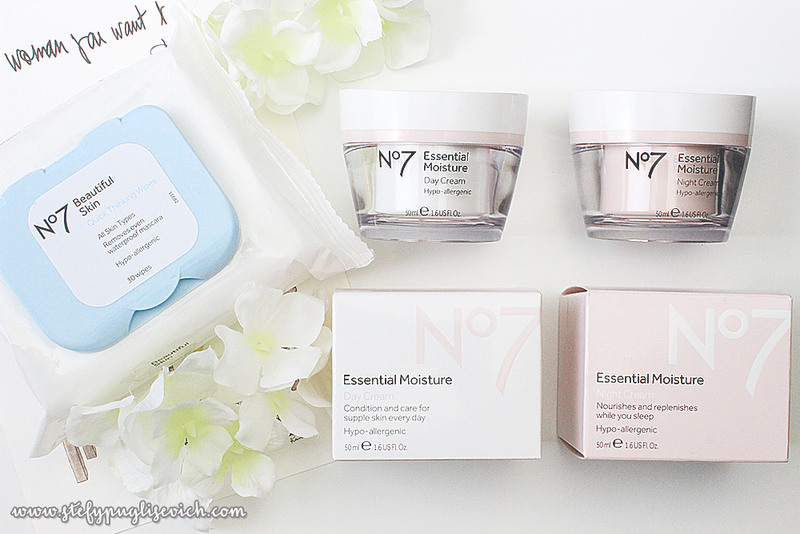 Have you Tried No7 Skincare before? What's your favourite from the range?